These films are freely available for screenings, at no charge – for use in festivals, conferences, events or teaching courses, among other special events. We only ask that you let us know where they have been shown and provide us with any feedback you might have. We look forward to hearing from you! More than fifty students, university staff and members of the general public attended a screening around food waste and organic food in Bangalore and Metro Manila. Discussions took place around the cost of organic food, cafeteria food quantities and related waste, and the challenge of connecting leftover food with the many people who go without regular meals in Metro Manila. There were some discussions around more traditional ways of handling food waste, such as the slaughter and consumption of a « fiesta pig » which used to be shared by all members of a community. All six films will be screened and discussed, in an event organized by lead researcher for Bangalore, Sunayana Ganguly, PhD. We warmly welcome any opportunity to screen and discuss these 6 films, which are available on this website and through the You Tube link below. Please contact marlyne.sahakian@unil.ch if you would like to access high-definition versions of the films. Film screenings and discussion organized by Megha Shenoy, Adjunct Fellow at ATREE. Discussions focused on the specific contribution on reviewing LCA studies to uncover trends in environmental impacts at the life stage of agriculture and food waste treatment. The significance of studying trends to then inform policies in various South and South-East Asian cities was also discussed. Moderated discussion by Dr Marlyne Sahakian, University of Lausanne, with: Dr Czarina Saloma-Akpedonu and Abby Favis, Ateneo University; Mara Pardo De Tavera, Mara’s Original Market; Ipat Luna, Environmental Lawyer; among other guests. Welcome and introductions by: Shalini Randeria, The Graduate Institute; Suren Erkman and Marlyne Sahakian (UNIL); Bernhard Fuhrer and Helena Ziherl (SNIS). Film screening on household food waste, followed by a panel discussion moderated by Shalini Randeria, with panelists: Christine Lutringer (UNIL), Loïc Leray (UNIL) and Uma Rani (ILO). 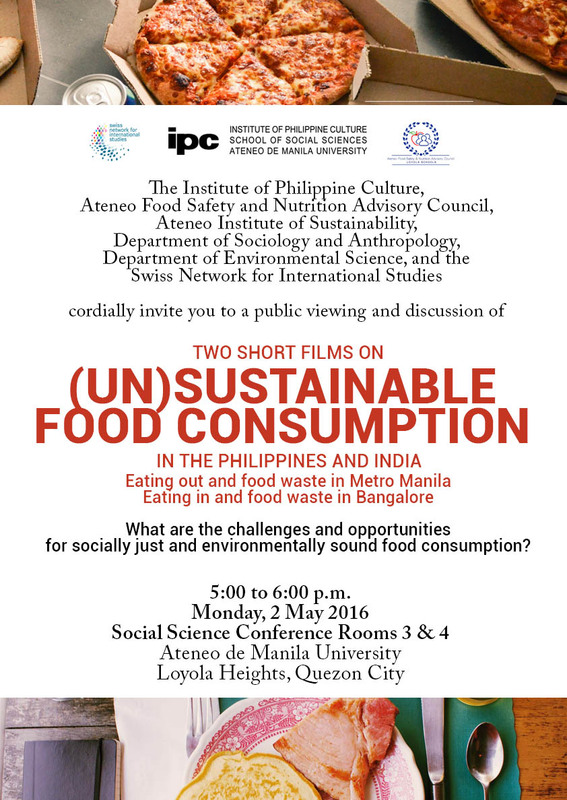 Film screening with a focus on food waste in restaurants and on a school campus, followed by a panel discussion moderated by Suren Erkman, with panelists Czarina Saloma-Akpedonu (Ateneo), Marlyne Sahakian (UNIL) and Garrette Clark (UNEP).